The combined landline and cellphone samples are weighted using an iterative technique that matches gender, age, education, race, Hispanic origin and nativity, and region to parameters from the 2013 Census Bureau’s American Community Survey and population density to parameters from the Decennial Census. The sample also is weighted to match current patterns of telephone status (landline only, cellphone only or both landline and cellphone), based on extrapolations from the 2014 National Health Interview Survey. The weighting procedure also accounts for the fact that respondents with both landline phones and cellphones have a greater probability of being included in the combined sample and adjusts for household size among respondents with landline phones. The margins of error reported and statistical tests of significance are adjusted to account for the survey’s design effect, a measure of how much efficiency is lost from the weighting procedures. The margin of sampling error for the complete set of weighted data is ±3.4 percentage points. 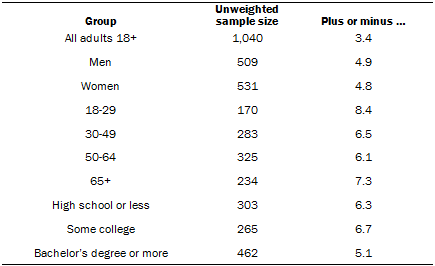 Results based on the 926 internet users1 have a margin of sampling error of ±3.6 percentage points. In addition to sampling error, one should bear in mind that question wording and practical difficulties in conducting surveys can introduce error or bias into the findings of opinion polls. Pew Research Center undertakes all polling activity, including calls to mobile telephone numbers, in compliance with the Telephone Consumer Protection Act and other applicable laws.